When George W. Ferris constructed the world's first Ferris wheel for the 1893 World's Columbian Exposition held in Chicago, he started a trend (and in a sense, he also helped usher in the modern amusement park). At a height of 264 feet, it was an imposing sight at the world's fair and attracted lots of attention and passengers. The original Ferris wheel was destroyed in 1906, but thousands of similar wheels have been erected through the years. One of the most iconic, durable, and unique examples of the ride is the Wonder Wheel at Coney Island. Introduced in 1920 at a height of 150 feet, it is still taking passengers for a wild ride in its swinging cars (as well as stationary ones) along Brooklyn's famous boardwalk. The Pixar Pal-A-Round at Disney California Adventure is nearly identical to the Coney island landmark. Wheels come in various sizes and can be found at many locations, including traveling carnivals, amusement parks, and tourist destinations such as the 175-foot Niagara SkyWheel at Niagara Falls. When the London Eye broke the 400-foot threshold in 2000, it kicked off a race to build ever taller models. The enormous rides, which include enclosed cabins and rotate slowly, are now generally referred to as "observation wheels," whereas smaller versions, including portable models, are still called "Ferris wheels." The following are the 13 tallest observation wheels (with some that are on the way). Icon Orlando (originally know as the Orlando Eye), opened in 2015, provides spectacular views of the area's theme parks, including nearby SeaWorld Orlando and Universal Orlando. It is one of the ​tallest rides in Florida (although, remarkably, not the tallest). The Orlando Eye is among a number of cool rides and attractions along the city's International Drive. 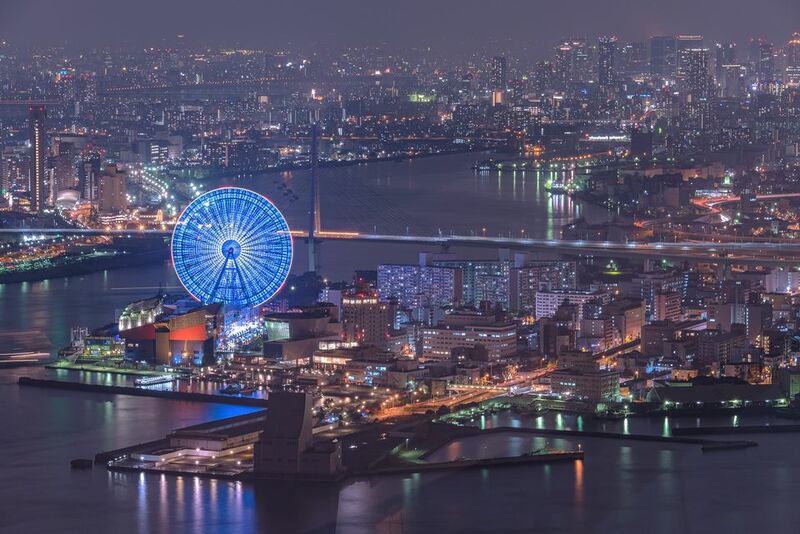 Opened in 2016, a year after the Orlando Eye made its debut, the Redhorse Osaka Wheel beats its Florida counterpart by a single meter (or four feet) in height. It is located at Expocity in Osaka, Japan on the site of Expo '70, the first world's fair ever held in Asia. The Sky Dream opened in 2017 at the Lihpao Land theme park in Taichung, Taiwan. Opened in 2000 along the River Thames in London, the attraction was originally known as the Millennium Wheel. Each of its 32 capsules can carry 25 passengers, and the single-rotation experience lasts about 30 minutes. Operated by Merlin Entertainments, combo tickets are available to visit other London attractions, including Madame Tussauds, the SeaLife Aquarium, and The London Dungeon. Located at the Nanchang Star Amusement Park in Nanchang, China, the Star wheel opened in 2006. Each of its 60 climate-controlled cabins can accommodate up to 8 passengers. The wheel has a number of lighting displays and puts on an amazing show at night. Opened in 2008 along Marina Bay in Singapore, the enormous wheel provides views of nearby Malaysia and Indonesia. Each of the 28 ​capsules is about the size of a mini-bus and can hold 28 riders. The featured attraction in the promenade at the LINQ Hotel and Casino along Las Vegas' famed Strip, the High Roller opened in 2014. Each cabin holds up to 40 passengers. Because this is Vegas, drinks are sold at the base of the wheel and can be brought along for the ride. Also, the wheel offers a happy hour each day with cabins that feature bars and a bartender. (There are no slot machines in the capsules, however—at least not yet.) The High Roller currently lays claim to the title of the world's largest observation wheel, although as the following entries indicate, there are some bigger ones in the works. This project has been cancelled and will apparently not proceed. Plans called for the New York Wheel to be located on the banks of Staten Island, near the dock of the Staten Island Ferry. It would have offered incredible views of the Manhattan skyline and the Statue of Liberty. At a cost of $230 million ($7 million for its lighting package alone), the wheel would have reportedly accommodated an impressive 1,440 passengers per ride. The length of the ride would have been an estimated 38 minutes. The massive wheel was first planned to open in 2015, but construction was delayed a number of times. The United Arab Emirates city already has the world's tallest building (the Burj Khalifa). And it will soon have the world's tallest observation wheel (until the next big one comes along). It's unclear when it might open, but construction has begun (albeit, proceeding slowly), and the Dubai Eye could be spinning by the middle of 2019. It will be located on a man-made island.